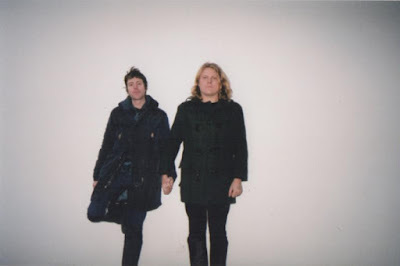 Ty Segall, famed cult rocker, teams up with fellow Californian psych purist White Fence. Antics ensue of the most predictable proportions. Interestingly enough, Joy represents two entirely different connotations for each artist. For Segall, the duo's second collaboration project (following 2014's Hair) is but a mere speck in his proliferate discography, having released the reinvigorated and creatively rich Freedom's Goblin earlier this year. For Tim Presley of White Fence however, this is his first LP in over four years. Momentum meets meticulousness, or at least one would assume. Rather than express their symbiotic Psych Rock and Pop duality as they did on Hair, the two mellow musicians resort to cheap language over well-worn instrumentation for a collection of material that's inefficient and utterly average. Perhaps the description should read: Superfluous meets discouraged rather than momentum meets meticulousness, as each of those potential pros come well-equipped with inverse cons. As the cover - an unembellished photograph of Segall and Presley holding their pets - implies, the duo whose origins lie in the carefree placidity of 60's and 70's bohemian Psychedelic Rock stagger in listlessness. Here, creativity is replaced by ephemeral grooves that rarely result in specularity. Unlike Freedom's Goblin, a whopping 74-minute ensemble, Joy instead slogs around half-baked ideas much like Segall's 2017 self-titled record. Tracks like 'Please Don't Leave This Town,' 'A Nod,' and 'Do Your Hair' epitomize questionable Segall imitations, feeling oddly similar to not only the artist's entire discography summarized, but also that blithely era he encapsulates. And with 13 of the 15 tracks failing to reach three minutes - nine failing to reach two - Joy quickly and abruptly renounces formality in favor of sketchbook slapdashery. A handful of these principle creations foster flavorsome melodies, like 'Room Connector' and 'Body Behavior,' which makes their scurrying prose even more bitter. Perhaps what impales Joy further is Segall's transformation into Psych and Glam Rock aficionado since Hair coalesced his hardened edge with White Fence's cool, calm, and character-driven demeanor. The distinction between each artist isn't as glaring now, which causes Joy to feel, in many ways, like a Segall solo effort with modest contributions on Presley's behalf. This doesn't apply to the rare instances in which both musicians branch out from their comfort zone by using unconventional structuring and freakish vocals. Opener 'Beginning' mildly manifests this format, only for Joy to lose that gumption until 'She Is Gold' near the end of the record. The five-minute piece bridges the gap between moody Krautrock and brainy Alternative Rock, which is as successful as follow-up track - and Residents-level quirkiness - 'Tommy's Place.' However, perhaps unsurprisingly, the best effort here is the one that finds Segall and Presley fine-tuning, and garnishing, the Psychedelic Rock they relish in; closer 'My Friend.' Finding Segall's melodramatic blubber amidst fluttering Sunshine Pop symphonies closes Joy out with shapely grace. If only the previous efforts of attrition weren't so unremarkable.